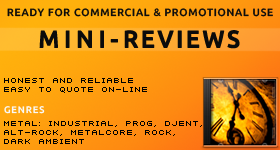 Music reviews are either presented in a form of witty short stories, technical reports or quick lame notes. Reviewers express their own opinions in different ways; either a critique is full of "I" or kept on a neutral level. I avoid talking about myself in a professional review since I'm not a subject of the review. Many may disagree as there are professionally written music or theatre show reviews in which a reviewer mentions himself/herself yet a general critique idea is about expressing one's private views. Indeed, but "me" is then mentioned only in a few spots - to explain and underline critic's personal opinion. On the opposite, many A&R and press reviewers will agree - a review must be about a product, not about its author. Therefore, such a professional writing should sound rather like a press release than a personal comment. 95% of the review must refer to the band and their single/EP/album because they're trying to sell it (or give away in some cases) through gathering some opinions, publicity and exposure. What sounds little professional about a music review? All that private life junk which neither a band nor a reader may benefit from. Confessions such as: a critic is overloaded with CDs so doesn't have time to review at all (then why are you doing this job? ), descriptions of what he/she just ate/drank (who cares? ), that his/her hard drive is broken so he/she lost an initial review, etc. Also mentioning places where the writer was listening to an album - a car, dark room, crypt, cavern, cornfield, the top of a mountain, etc. make no sense unless songs rhythm or mood may deepen a listening experience in such locations. Moreover, there's absolutely no need to mention God or other religious beings/beliefs ("God only knows why they wrote such a long album". No, musicians exactly know why they did it, yet some of them or your readers may be atheists! ), unless you're reviewing religious music or the lyrics refer to this topic. Don't mention brands of audio equipment which you used during listening unless you've a sponsorship deal with the producer or a store. Your readers may not own these gadgets or don't even want to buy them just to check out if you're telling the truth. Still, it's a piece of information to add only in a section including affiliated links, not in the review body. If you write in a foreign language (like I do), which is always a challenge due to a different style & grammar, it'd be the best if an experienced editor/native speaker could additionally proofread your work to make you sound like a pro. The editor doesn't create your review but corrects it technically. Your opinions & writing remain yours. I could go on and on with such examples but it's enough if you get an idea. Instead, writing a professional review is a process similar to sculpting then polishing since it needs good 'proportions' and so it requires multi-editing. Sometime it makes sense to avoid reviewing every single song individually, but instead, to find characteristic values they represent and group them within a review, in opposite to the tracklist order. Or you can review one or two songs in detail but group all others. Or eventually to review 1/3rd of the tracklist (f.e. the best tracks) in detail and then only mention and compare remained songs based on their arrangements, mood, dynamic, production, performance etc. Learning about a psychology of reading (eye-tracking, read more here) is also crucial. If a review is long (and most of professional reviews are because there's so much to say yet writing is fun! ), then an ordinary reader focuses on a few lines of the top paragraph (keywords = a band name, album title, genre but also a rating), then skips to the middle, and then reads the summary. Detailed reviews may look too overwhelming to read on little mobile screens when compared to viewing them on at least a 12" screen size. People rush these days and browse the Internet on cellphones, therefore creating reviews short enough yet accurate (based only on a few sentences and including all what should be said about a song/release) becomes important. It's difficult to do but there are witty writers who can condense their opinion to just a snippet-like paragraph. This is an art of reviewing but it's worth of learning, which I've been practicing for some time too. The process of reviewing is time-consuming; it may take a few hours to a day or a few weeks (if a writer is little inspired, happens) and may also include an additional on-line research (if some names ring a bell, f.e. when any famous musicians/producers worked on the album). Therefore, such a writing falls under a definition of 'work'* which results in creating a copyrighted material (assuming it's not a rip off of somebody's review). Stealing a copyrighted material (by copy-paste) and using it for own purposes is prohibited by law all around the world. Therefore, bands must not paste your entire writing on their website to encourage their fans to buy their release without your written agreement or buying a license (it's usually a non-exclusive commercial license). They may only use a very short snippet instead, and should redirect their fans to read the entire review on your website/blog. In both cases, they have to credit your work properly - the way you require. Because reviewing means doing a creative work, it is always a matter or inspiration. Thus, the final timing may be little predictable and has nothing to do with musical values either. Bands have album pre-sales and other campaigns so they want to collect some feedback before the release hits the music market. If you told them when they could expect a review yet you already know you won't make it on time, email the band and schedule another day. Good ideas come with time and therefore, writers hate deadlines. For above reasons, I've been offering both detailed and short music reviews. My major rule however, is that I don't review music I dislike and genres I'm not experienced with. It is fair. Otherwise, I'd waste time yet a band would not benefit from a negative review either. Some may find my high rating suspicious, but like I wrote above, it's honest because I review only music which I find having strong potential to be noticed and when I know what to write about it. You should never force yourself to review music you know little about because your opinion will not sound reliable. I turned down many country and pop submissions because I avoid improvising. Yet I redirected such artists to other reviewers who could eventually give them trustworthy opinion thanks to their experience. (Can't review metal or industrial music? Send this artist to me). Though, if a band shares a metal (inc. industrial, progressive, alternative metal, even djent), rock or dark ambient albums with me, I may become inspired to write about it. I use all my empathy & good sense of hearing to tune in and understand values which the band aimed to express through their music. It's usually about guessing, however according to received testimonials, I guess correctly. Technically, reviewers use own customized templates which help them keep a review well organized. My standard template for both detailed and mini-reviews consists of 7 parts. 1. 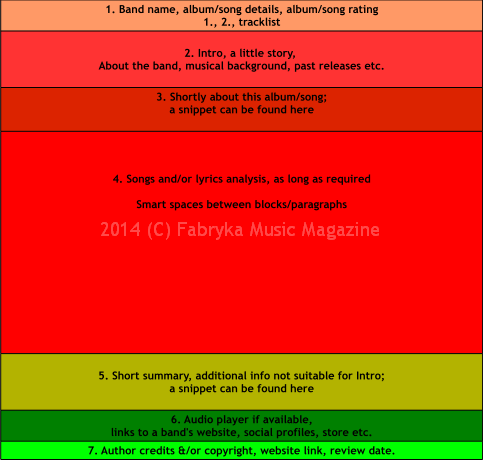 The top includes details such as a band name, release title, label, release year and my rating. There's a tracklist below names etc. which can be presented either in a form of a simple horizontal list separated with commas and spaces or as a column with an additional tracks length. Keep the original spelling of the band name and label - the way they use it on albums and their official website. If you're not sure due to possible differences, ask the band. Album title should be changed to italics (Album Title) in the review body but it can be left without formatting in the header. 2. Next, an opening part of my review is an introduction to an artist and tells a bit about his or her musical background or mentions past release(s). When readers want to discover a new artist, they'd rather learn it from one source than be redirected to many other sites. No time for this! Of course, it makes no sense to present a well known band, but bringing up their latest release, guest musician(s) or line-up changes sound reasonable. The intro can't be too long however, because as I mentioned before, the reader's attention is quite fragile when they have so many on-line news and articles to process daily. Usually, a snippet which a band uses to promote their release is placed either in this intro or the final summary. Keep the original spelling of musicians' names (Russian, Polish, Swedish etc. which include specific characters); copy & paste but they still may be displayed incorrectly due to character encodings of various systems and publishing platforms. 3. While #2 is an easy part to complete, here comes something which requires a harder work - an introduction to a release which should not reveal everything yet. Its goal is to only give a glimpse of what a reader may expect further. It is to make him/her either read that review to the very end or leave a page. Most of people know which tunes make them interested so a reviewer can mention a rhythm, moods, etc. values representative for the entire album and include other famous yet matching band names whose music sounds similar. This also works well for the review to be well positioned in search engines (SEO method) or platforms such as Last.fm - the critic uses names as keywords and/or can tag names/titles which are then linked to existing band profiles, songs and releases. When a band is little known, they may benefit of such linking and recommendation. Though, too much linking in case of both little or well known bands may sound a bit offensive yet boring, as if they came up with a copy of somebody's work instead of own original release (unless it is a rip off, or a cover album). 4. Songs critique is rather easy if you do a technical analysis but it's cool to smuggle some comparisons and scenes which are brought on your mind while listening too. Such an analysis should be kept simple, far from own philosophies and broken style (examples can be found in some reviews of black metal albums written for radical metal fanzines). Don't swear and don't use slang either. The hardest part for me, and probably for other reviewers as well is to avoid listing songs as "This song is about this, the next song is about that" etc. starting from their titles. It is almost unavoidable but making smart stylistic links between such paragraphs seem to be helpful just for a smooth reading. When a song sounds little inspiring, I additionally analyze its lyrics or a related music video which the band made for a certain track. It happens that an artist may be little skilled when it comes to writing song arrangements but a lyrical content turns out intriguing - not how it fits within a song but its poetry and hidden meanings. There may be a thing or two which a reader may identify with - a personal revolution against something, a relationship gone wrong etc. However, since the review is about a song/album, therefore any additional info should be limited to a necessary minimum. Album titles should be formatted with italics, while songs titles should be put in quotation marks; like in this example: The Downward Spiral (1994), "Heresy". If you quote a song lyrics, put this part in quotes and you may additionally change this text to italics so it'd look different to song titles: "Your god is dead and no one cares / If there is a hell I'll see you there". Avoid writing with all upper case (it looks like a shout) and boldface (ever read any Blabbermouth news?). 5. The final summary is the nicest part to do because it expresses the reviewer's overall impressions about the release. Still, it's useful to avoid repeating things which were underlined in the intro (see #3), since the reader might have not skipped this part. A snippet can be found here as well. The summary can also include additional info about future plans of the band (such as a tour/live shows, incoming new album, new music video, etc.) to encourage a reader to follow the artist. These news must come from and be confirmed by the band. However, they should be utilized carefully since reviewers won't track any events and re-write reviews in case of cancellations or any other problems in the band. In fact, redirecting the reader for future updates available on the artist's official website/social profile is the safest option. 6 or 7. Reviewer's credits, copyrights, avatar/picture, website link, and other useful identification data as well as the review date (important!) can be found at the very bottom of the template. 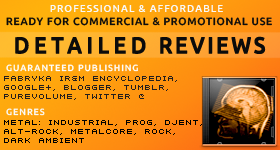 In some press reviews, these details can be found above the header while an album rating is placed in the footer. 7 or 6. Finally, when it comes to publishing the review, the bottom of the site may include a music player with a related release. It's useful to let the reader compare what you wrote about with what they can hear on their own. Most of music social networks such as SoundCloud or YouTube allow for embedding such players, yet a video player may be important if you praised the music video. The disadvantage of embedding is that an owner of a video/song can delete them and it's then difficult to track idle players on the publisher's website. In my mini-reviews, parts 1, 6 and 7 are kept full while 2, 3, 4 and 5 are shrunk to a desired minimum. On the final note, I used to share my opinions about both inspiring and bad albums in the past (2001-2004), but I can't call them 'reviews' now. I used no editor's help either. Those short notes were written in a hurry, just to fill in the magazine (founded in 2001) with as many titles of matching releases as possible. This was done to make Fabryka catch the traffic and attract to its main goal - discovering and promoting the best of industrial rock, then also industrial metal bands. After years passing by and mastering my own writing skills (but hey, I still need an English editor's help since English is not my first language! ), I can see why young reviewers dive into it with passion, then burn out quickly. I've seen magazines dedicated only to music reviews come and go after 2-3 years. The main reason is that either reviewers weren't hired by somebody to pay them for writing or didn't charge for their work* individually. This is a real job which requires as much experience as dedication and we need to be paid for doing it when we provide artists with a professional writing. Bands send hundreds of CDs, expect exposure but a day has only 24 hours which should be wisely shared between work, leisure & sleep. You can't sit all day long working for somebody for free while they may benefit from your work yet they won't share this income with you or even donate your magazine/blog. Thus, if you want to be a reviewer, you should wisely think about pros and cons before you share your skills with strangers. That's OK if you have an external job which pays well but you may spend 8 hours or more working there so in fact, you'll have not much time and/or energy for any creative writing. Oh, and don't get discouraged if you expect comments for the review and there's nobody responding. I noticed a long time ago that people simply don't know how to comment on music reviews (unless it 'hurts' a well known artist who is followed by millions of die hard fans) or reading is just enough. Once you master writing music reviews, you may switch to theatre, movie or book reviews because there are different values to pay attention to and yet you will avoid boredom. Reviews (and good reviewers) are still needed though and won't die out. *Those who wish to get any professional writing for free then sell their stuff based on it - read this post. 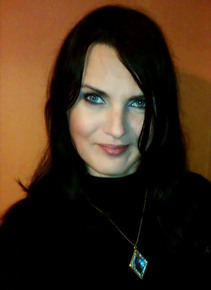 NINa has been actively supporting the industrial rock and industrial metal music scenes since 2001 through her well known Fabryka Music Magazine. NINa is an artistically talented person who has a great sense of hearing what is on the cutting edge. Working within the magazine has allowed her to greatly increase her knowledge of music industry insights as well as develop many other skills. She writes detailed reliable reviews of heavy guitar driven music. NINa has a degree and license in business management and marketing. Since graduating in 1998 from business management she also obtained a license in graphic design in 2000. She's been designing original CD cover artworks since 1994 and working on her debut post-apocalyptic multimedia book (Heatwave) since early 2010.